Having joined Juventus on a 105 million euro deal, Cristiano Ronaldo has paid tribute to his time at Real Madrid with a farewell letter. 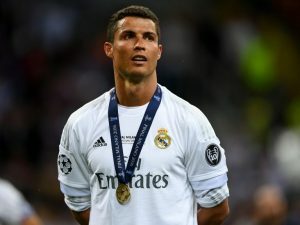 The wealth of goals, trophies and memorable moments accumulated by the winger will live long in the memory of every Blancos fans, and indeed the man himself. These years at Real Madrid, and in this city of Madrid, have been possibly the happiest of my life. I only have feelings of enormous gratitude for this club, for the fans and for this city. I can only thank all of them for the love and affection I have received. However, I believe that the time has come to open a new stage in my life and that is why I have asked the club to accept this transfer. I feel that way and I ask everyone, and especially our fans, to please understand me. They have been absolutely wonderful for nine years. These nine years have been unique. It has been an exciting time for me, full of consideration but they have also been hard because Real Madrid have very high demands, but I know very well that I will never forget that I have enjoyed my football here in a unique way. I have had fabulous teammates on the pitch and in the dressing room, I have felt the warmth of an incredible crowd and together we have won three Champions Leagues in a row and four in five years. And also, on an individual level, I have the satisfaction of having won 4 Ballon d’Ors and 3 Golden Boots. All during my time in this immense and extraordinary club. Real Madrid have conquered my heart, and that of my family, and that is why more than ever I want to say thank you: thanks to the club, the president, the directors, my colleagues, all the coaches, doctors, physios and incredible staff that make everything work and that are on top of every detail tirelessly. Thank you infinitely once more to our fans and thanks also to Spanish football. During these nine exciting years I have had great players in front of me. My respect and my recognition to all of them. I have reflected a lot and I know that the time has come for a new cycle. I’m leaving but this shirt, this badge and the Santiago Bernabeu will continue to always feel as my own wherever I am. Thanks to all and, of course, as I said that first time in our stadium nine years ago: Hala Madrid!